After something as special and amazing as Skyfall, it’s no wonder the follow-up isn’t quite as special or amazing. But Spectre is certainly no Quantum of Suckitude. So there’s that. The film starts with one of those “uninterrupted” shots that has half a dozen places where you know they actually cut the film and edited it together seamlessly. I’m of two minds about that kind of thing. Part of me is annoyed that I’ve been forced to notice and analyze the trickery employed. The other part of me enjoys the sense of momentum it nonetheless imparts when the sequence is well done. And this one is. It takes place in Mexico City on the Day of the Dead, starting in the middle of the festival, with Daniel Craig’s James Bond in a skull mask. It leads into a crazy action sequence that had me on the edge of my seat. Without getting into to specifics of the plot, the basic idea is that all of the films of the franchise since the reboot have ties to this one bad guy (Christophe Waltz). I like this conceit, that he was in the shadows, connected to Le Chiffre, Dominic Greene and Silva. There are also callbacks to Vesper Lynd and, of course, Judi Dench’s M. There’s also a wonderful scene with Mr. White (Jesper Christensen), who we may remember from Casino Royale and Quantum of Solace. Sadly there is only a quick reference to Felix Leiter. No soup for you, Jeffrey Wright. I can’t say Monica Bellucci or Léa Seydoux add much to the proceedings beyond eye candy, but at least they are good actresses and don’t detract from the film. Part of me feels that the subplot happening back in London through the film is kind of tacked on, to give Ralph Fiennes, Ben Whishaw and Naomie Harris something to do. But another part of me likes all three of those actors, so it’s a wash. The end of the film is kind of wishy washy affair. It’s equal parts “This is the end of the Daniel Craig era” and “This was pretty good, but the next one’s going to be great!” Those are two really dissonant messages for a film to end with. 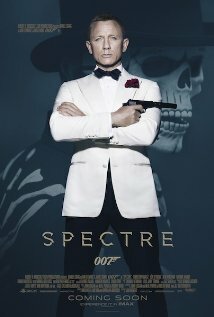 I think this is a solid installment, but certainly not in the top 5, or even top 10 of Bond films.